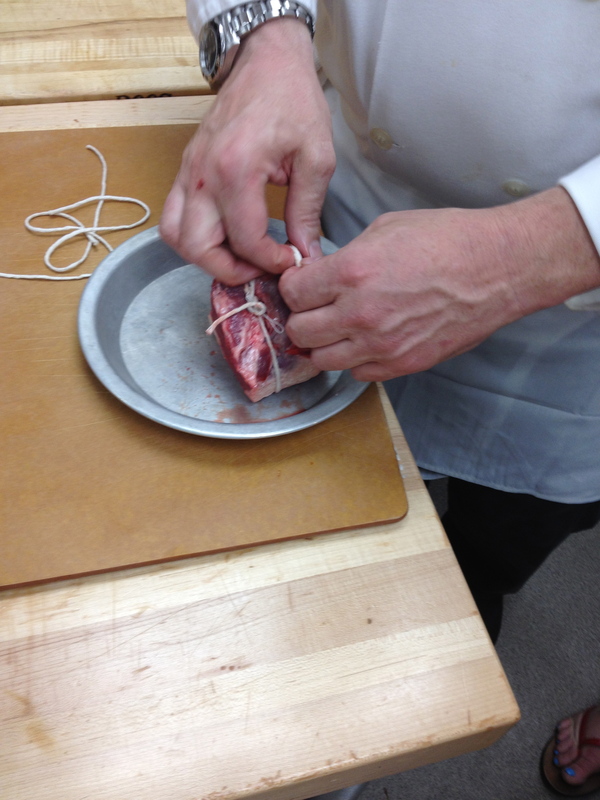 I went to my second cooking class this week. I had purchased a silent auction item at the Sunset at the Ritz benefitting the Rocky Mountain Chapter of the ALS Association at The Kitchen Table. 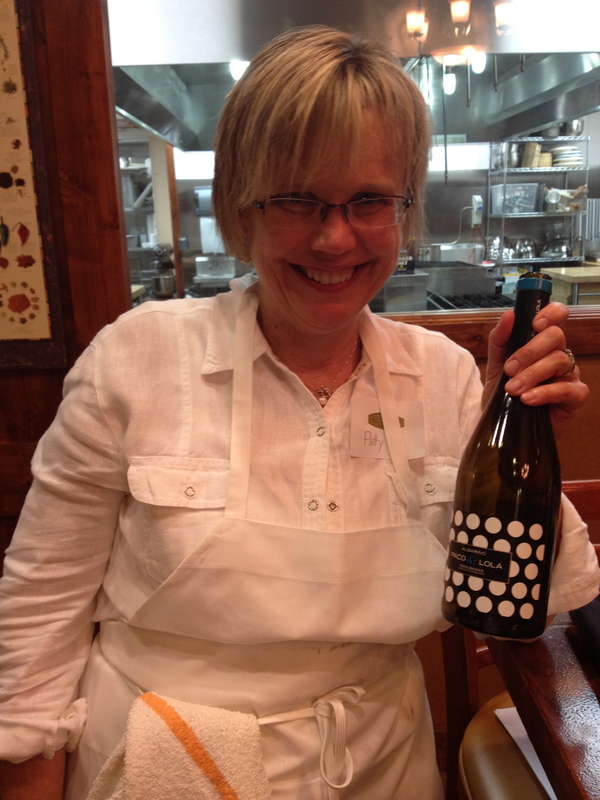 I had eyed the cooking classes for several months, trying to figure out which one to take. 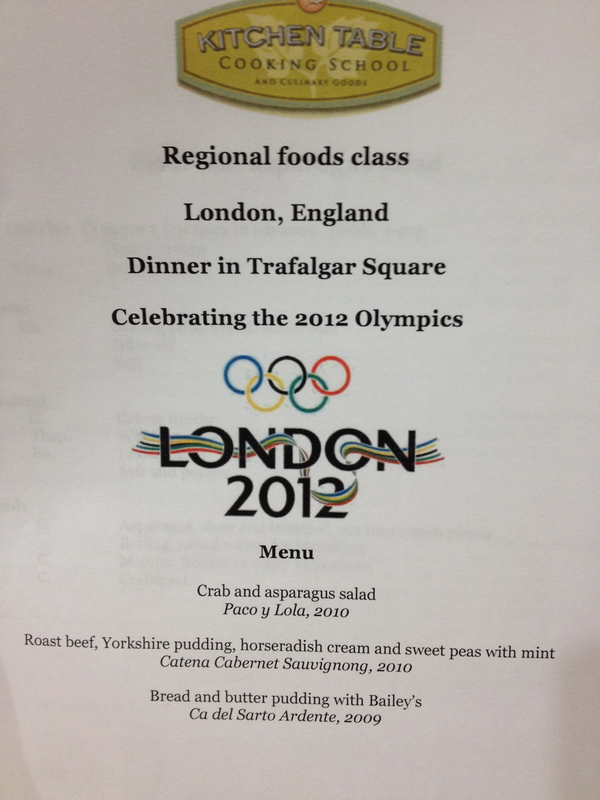 My summer has been busy, but I saw a break in my schedule this week and leapt at a recently added class celebrating the Olympics and British Food. Sunday was the day to serve a grand meal as Monday was wash day and gave the cooks a break to clean up and eat the leftovers. 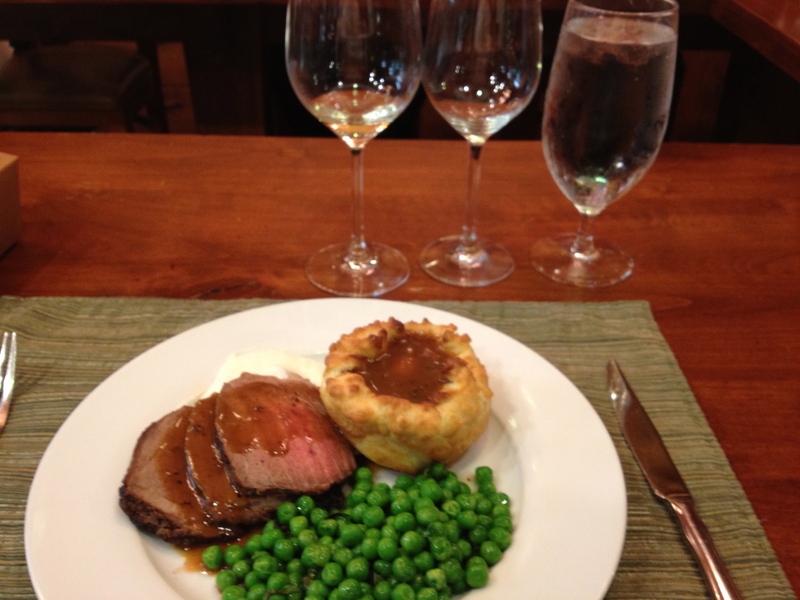 Our menu was crab and asparagus salad, roast beef, savory Yorkshire pudding, horseradish cream, mint peas, gravy and a bread pudding. The Kitchen Table pre-made creme fraiche (fresh cream) that we used for the salad dressing and the horseradish cream for the beef. 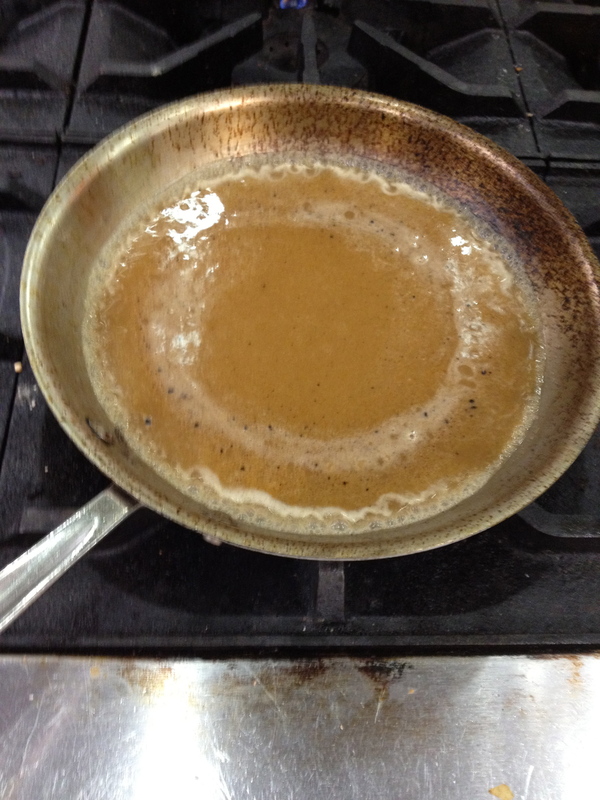 Also pre-made for us was a veal stock for the gravy. 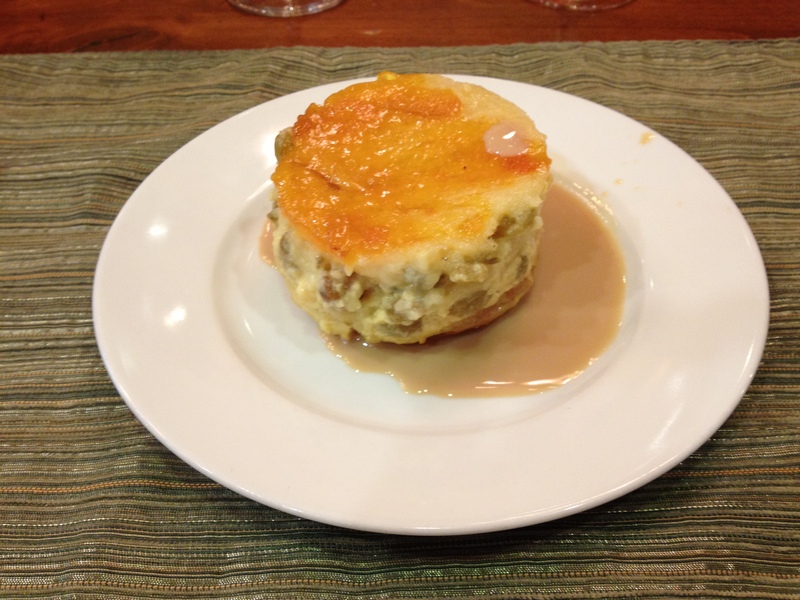 The first item we made was the bread and butter pudding with Bailey’s (oh yeah). 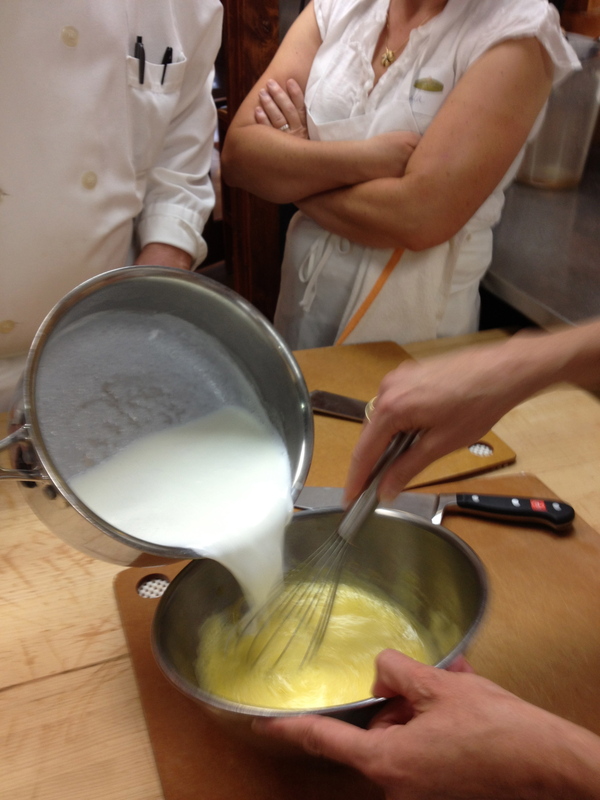 We made a creme anglaise (English cream), a custard mixture similar to one for an ice cream. 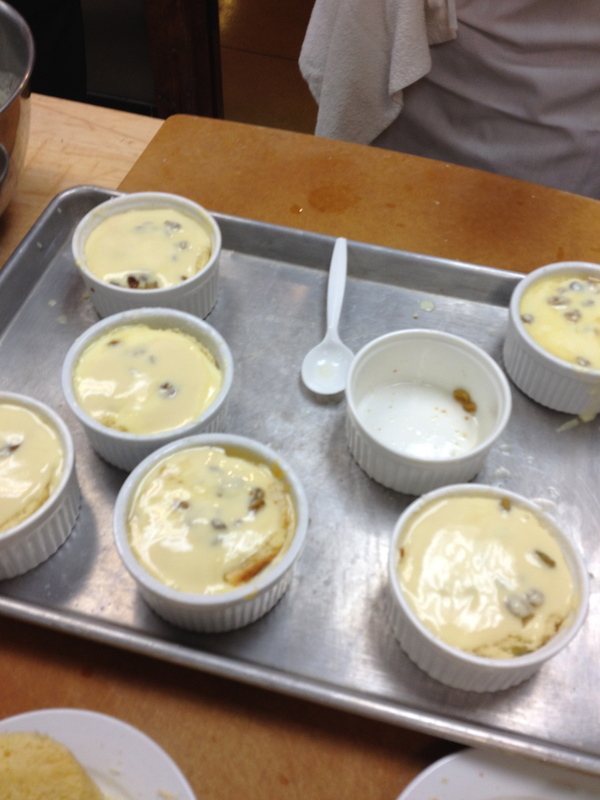 We layered apricot jam, circles of brioche, rum-soaked raisins, all soaked with the creme anglaise to ramekins. They were popped in the oven while we constructed the rest of our meal. Next was to build our Yorkshire and pour into ramekins with lard in the bottom (oh yeah), make the horseradish sauce, and truss our beef. 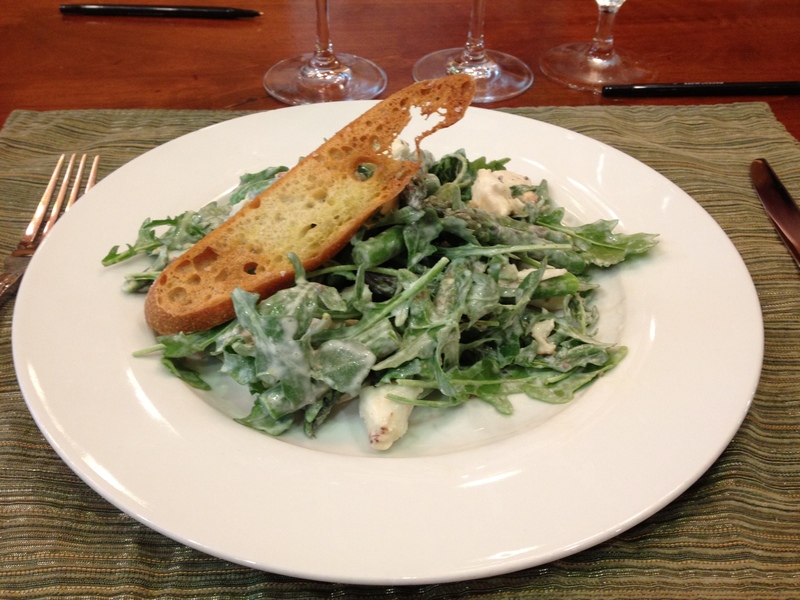 After those tasks we constructed our salad with a creme fraiche, lime and grainy mustard dressing. After we munched on our fresh, lovely salad, with Paco y Lola, 2010 white wine we returned to the kitchen to braise our beef, make our gravy, and heat our buttered, mint peas. 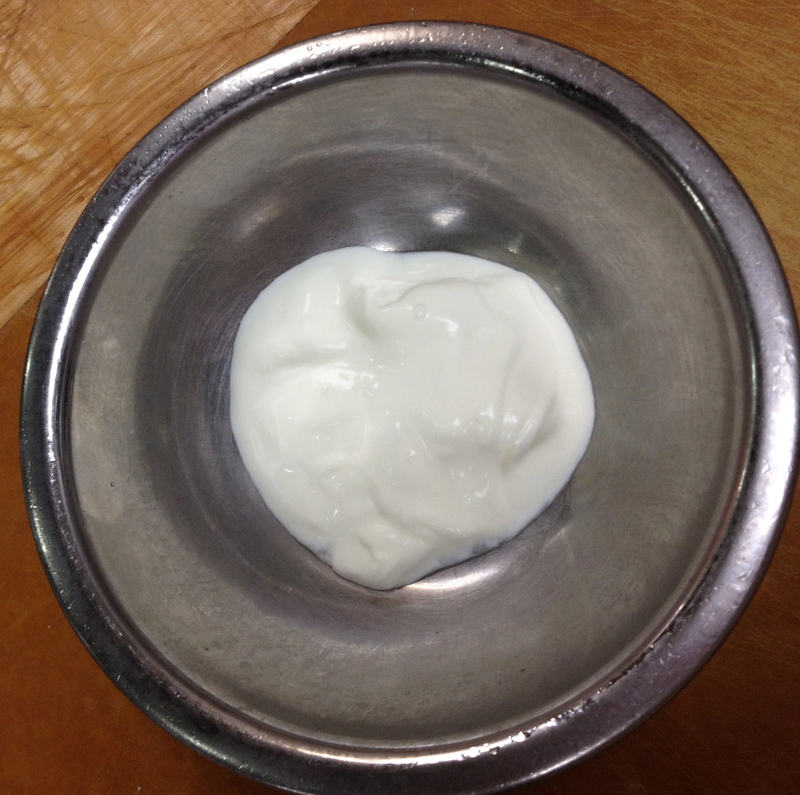 1) Creme fraiche is easy to make at home and tastes better than store-bought. Heat 1 C cream to 105 degrees in saucepan, remove from heat and stir in 1TBS buttermilk. Place in shallow container, cover with plastic wrap and leave on the countertop, warm area and stir every 8 hours for 2 days until thick. Refrigerate once set. 2) When removing bread and butter puddings from ramekins place the sharp knife along the edge and turn the ramekins, do not move the knife up and down. The pudding edge will come out smooth not jagged. 3) Don’t play with the beef, leave it in the pan to braise on all sides; let is rest after oven baked by tenting it with foil all before slicing it. 4) Good lump crab can be purchased canned. When added to the salad don’t break apart the crab, be gentle with it. 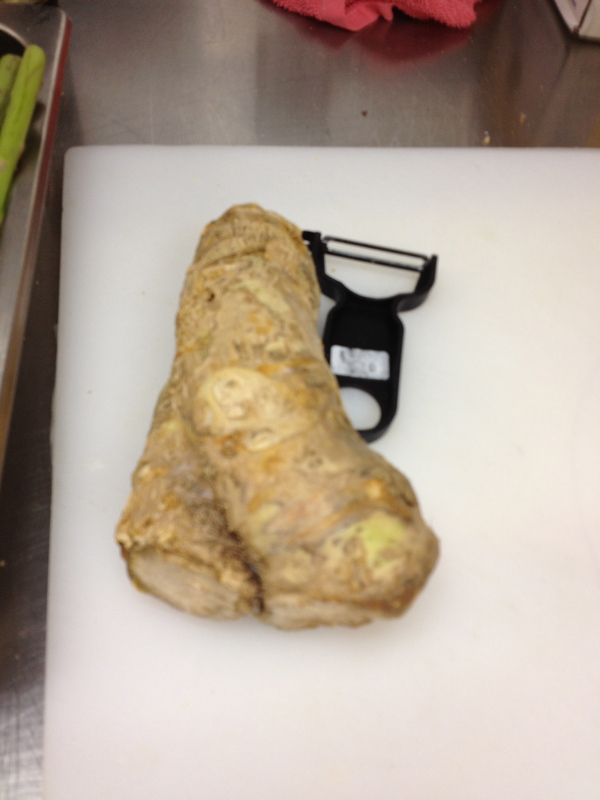 1) I loved the horseradish. Now I want to buy one. It’ll go great in my sauerkraut (see https://thefearlesscookingclub.com/2011/09/). My husband loves horseradish cream with beef. It was so fresh. 2) I loved the Yorkshire pudding. I know crazy huh? all those carbs and lard? They puffed up so beautifully. Chef Tom said it was the cold egg batter poured into the hot ramekins with hot lard, popped into the oven that made them puff up. One student in the class said this class was then next best thing to going to the Olympics (which was on her bucket list). It was fun. I learned great techniques and a little bit more about England. The class found it fascinating and maybe scared (?) that I had a food blog. I assured them that I only make fun of myself in this blog. I made a few mistakes in the kitchen, using the wrong pan a couple of times. 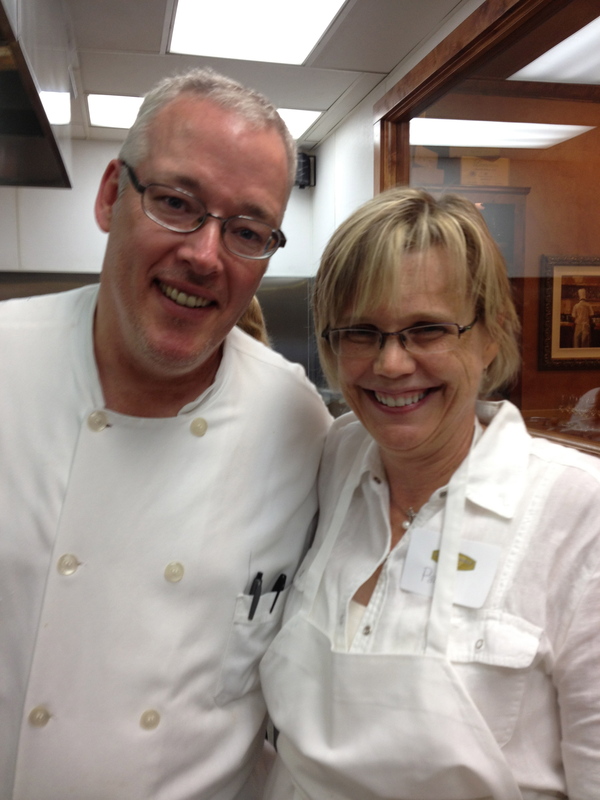 Chef Patricia set me straight and was a great resource in the kitchen. I bonded with another macaron fan and I have already lost her e-mail to send her my most recent macaron recipe. Send me a message okay? This entry was posted in Baking, comfort food, cooking, Culture, England, Food, food blogging and tagged baking, British cuisine, comfort food, cooking, cooking classes, food, food blogging, Olympics. Bookmark the permalink. Gold medal presentation, Patty! Fun to read and learn. Keep the blogs coming. Thanks Char Have you been to England? I know Joy and Cindy have been. Looks like a fun cooking class! All the hands on and you get to eat and drink after! 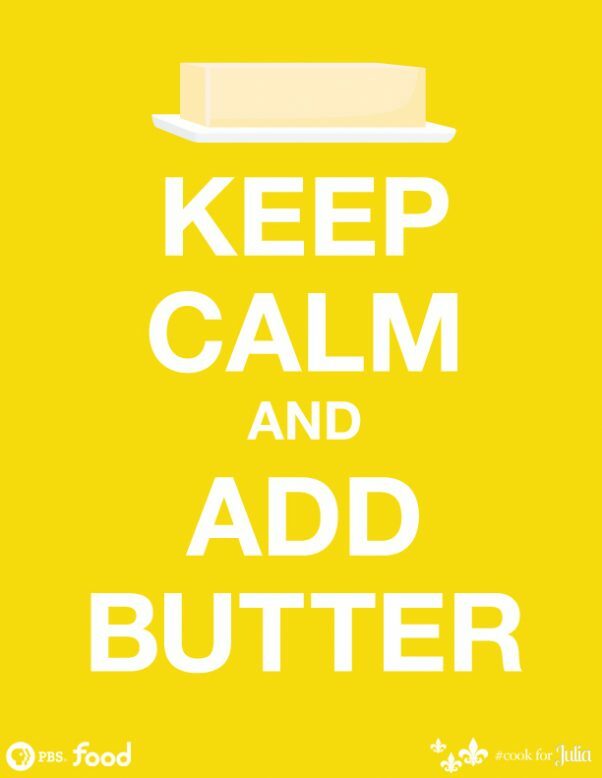 I’ve read about making your own creme fraiche at home but have yet to try. Would give it a go one day. Btw I think Yorkshire puddings are fantastic too!! It was quite fun. 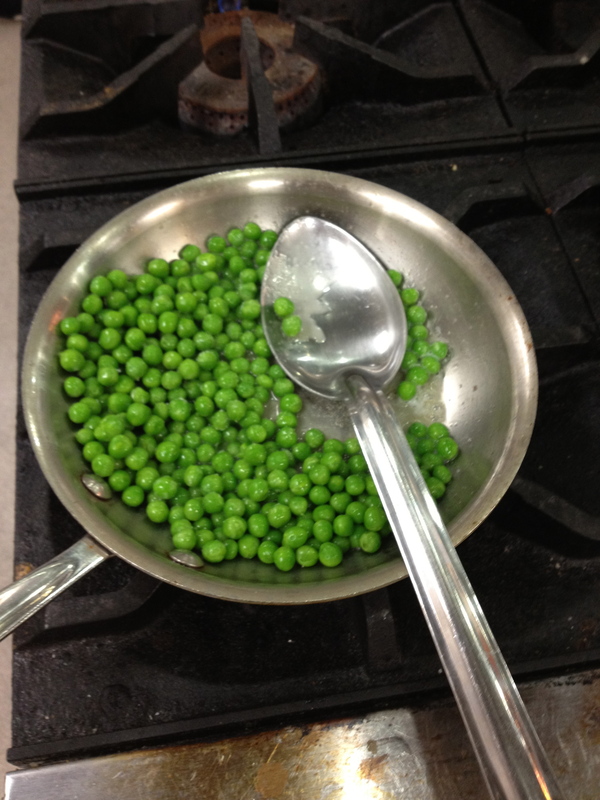 It’s like going out for a classy meal you made yourself (with a little direction and coaching from two chefs). Oh very complimentary of you Janna. And ha ha to the FN show. I can only agree with your title! 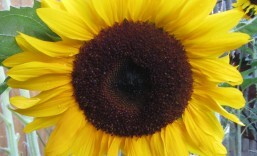 I am honored you dropped by my blog as you are a true Brit! Never been to England but I do love their pies. Thanks for dropping by my blog. My apologies on my tardy reply. I have been on a marathon of working and completing a class the past 10 days. It is now completed – hurray! But I have been cooking up holiday cheer, snapping pictures and preparing future posts. Stay tuned!